Transportation platform Lyft is partnering nationally with Take The Lead Day and moving as a company toward gender parity in leadership. Female freelancers earn 32 percent less than men doing the same job and that needs to change. Here's how. 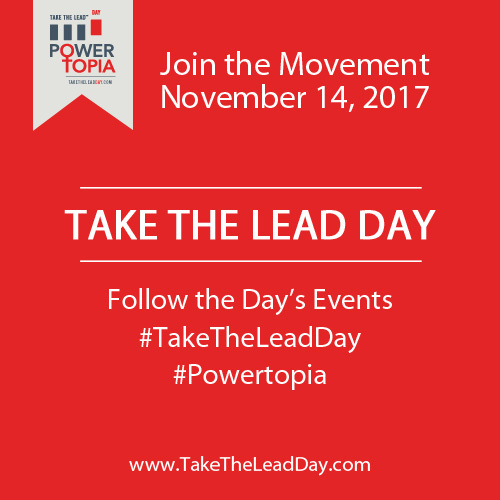 Learn about the latest Take The Lead Day events and special offers including apparel that benefits the mission of gender parity by 2025. Gloria's "The Sum" Weekly Column: The Word of The Week Is JOIN. As in come together. As in take part. As in join me for Take The Lead Day. Come together with thousands of other women globally for the first ever November 14 for free events all around the world . It’s not too late if you want to host your own and you can livestream the New York hub events. If you are in the NY area, join us in person for the Powertopia Symposium from noom-4:30 pm and/or the cocktail reception and performance event “Powertopia: Women, Power, and the Art of Leadership Parity.” Find more detailed information about the program for these two events here. Gather your friends and colleagues for a watch party for Powertopia, Take The Lead Day November 14, with livestreamed events and webinars during 24 hours of action to move women to gender parity in all forms of leadership by 2025. Get started here on our website. Gloria Steinem and Gloria Feldt discuss the importance of Take The Lead Day. Men ask more questions at conferences. No surprise to anyone who has ever attended one. Female reporters have long dealt with sexual harassment. If your spouse won;t support your career, you're better off single. A recent forum on freedom at The Bush Institute shows girls and women can run the world. Stay tuned to learn more about Black Women About Business. ATTEND THE NY PERFORMANCE EVENT: Powertopia: Women, Power, and the Art of Leadership, featuring former U.S. Treasurer Rosie Rios, the rock group BETTY, actor/activist Kathleen Turner, and many more surprises, including your opportunity to speak up from the audience. Tickets here.